CATU Electrical manufacture a broad range of Arc Flash Clothing, PPE and Protection Kits - this includes arc flash suits, arc flash hoods, arc flash helments (face shields) and arc flash overall suits in both Indura and Nomex arc flash and flame retardant fabrics. Arc flash can occur during live cable jointing, phasing in operations, racking in and out of switchgear, reclosing of electrical switchgear onto a fault, switchgear failure, excavating near live cables or accidental contact with live conductors during maintenance. Indura fabric provides arc flash protection, comfort and value. Indura Ultra Soft fabrics provide superior test results in electric arc flash and flash fire testing. It is important to recognize that in the event of a momentary electric arc flash, flash fire or molten metal splash exposure, the FR fabric used to construct the clothing is a critical factor in determining the amount of arc flash protection the garment will afford the wearer. Nomex fabric is inherently flame resistant which means its thermal protection is permanent – Nomex arc flash clothing cannot be washed out or worn away. Nomex fabric will not melt, drip or support combustion in the air. 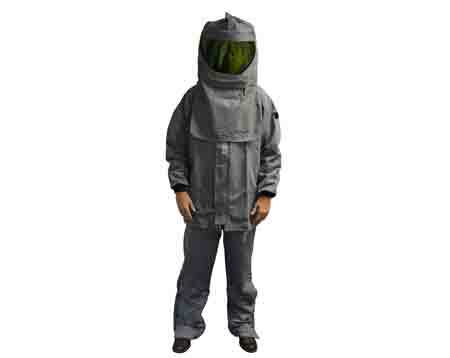 Nomex arc flash protection clothing provides high break strength, tear resistance and abrasion resistance properties. "When an electric current passes through air between ungrounded conductors and grounded conductors the temperatures can reach 35,000°F. Exposure to these extreme temperatures both burns the skin directly and causes ignition of clothing, which adds to the burn injury. The majority of hospital admissions due to electrical accidents are from the arc-flash burns, not from shock. Each year more than 2,000 people are admitted to burn centres with severe arc-flash burns. 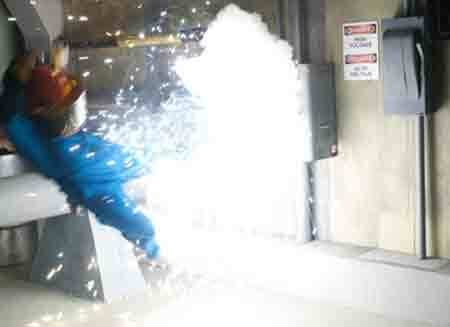 Arc flash can and will kill at distances of 10 ft."
T&D UK stock a broad range of Arc Flash Clothing and PPE. An electrical arc is an electrical breakdown of a gas (e.g. air) which produces an ongoing plasma discharge, resulting from a current flowing through normally nonconductive media such as air - a synonym is arc discharge. An arc flash is the consequence of an electric arc which can occur where there is sufficient voltage in an electrical system and a path to ground or lower voltage. Arc flash is usually caused by a short circuit of energized conductors. An arc flash caused by an electric arc with 1,000 amperes or more can cause substantial damage, fire or injury. The massive energy released in the fault rapidly vaporizes the metal conductors involved, blasting molten metal and expanding plasma outward with extreme force. A typical arc flash incident can be inconsequential but could conceivably easily produce a more severe explosion. The result of the violent event can cause destruction of LV-HV electrical equipment involved, fire, and injury not only to the worker but also to nearby people. Forces may exceed 100kPa (KiloPascal) and debris is spread up to 300 meters / second with temperatures of up to 20,000°C. In addition to the explosive blast of such a fault, destruction also arises from the intense radiant heat produced by the arc. The metal plasma arc produces tremendous amounts of light energy from far infrared to ultraviolet. Surfaces of nearby people and objects absorb this energy and are instantly heated to vaporizing temperatures. The effects of this can be seen on adjacent walls and equipment – they are often ablated and eroded from the radiant effects. The thermal incident energy onto the worker can cause severe skin burns or have lethal consequences.